COLLEGE STATION, Texas – By the time the final piece of confetti fell inside the Gilliam Indoor Track Stadium, the Florida men and Georgia women held their respective gender’s national team titles above their heads following the conclusion of the 2018 NCAA Division I Indoor Track & Field Championships. 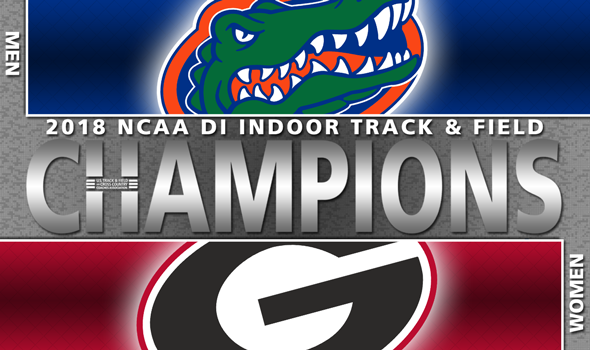 This was the Gators’ fourth indoor team title in program history and the Bulldogs’ first in either indoor or outdoor track & field. Florida surged to its first indoor title since 2012 thanks to a late push. The Gators scored 19 of their 40 points in the final two events of the meet – the triple jump and 4×400 – and knew by the start of the 4×400 that they’d only need to finish fourth or better to win the crown (Florida took third behind Southern California and Texas A&M as all three dipped under the previous world record of 3:01.77 set by Poland). KeAndre Bates and Grant Holloway carried the Gators once again. Bates and Holloway combined for 30.5 points with Holloway doing a yeoman’s work with 19.5 of his own. Southern California, Georgia and Virginia Tech rounded out the men’s podium teams in second, third and fourth place, respectively. The Bulldog women took the lead following the long jump and never looked back. Georgia scored 24 of its 61 points in that event thanks to a clean sweep. The Bulldogs went 1-2-3 with Kate Hall, Keturah Orji and Tara Davis doing the honors. That was the first time in NCAA DI history that a team swept a field event (Nebraska’s women went 1-2-3 in the 55 meters 34 years ago). Orji added another triple jump crown to her legendary career and broke the meet record with a mark of 14.27m (46-10). She became just the third woman in NCAA DI history to win three consecutive indoor triple jump titles, joining former Florida State star Kimberly Williams in that regard. History was also made off the track as Petros Kyprianou became the first foreign-born head coach to win an NCAA DI women’s track & field team title. Arkansas (second, 49 points), Kentucky (third, 34 points) and Florida (fourth, 32 points) were the remaining women’s podium teams.